Delta is having a pretty good week on the sales front. Last night they announced a 128K roundtrip price for Delta One flights to many European cities. 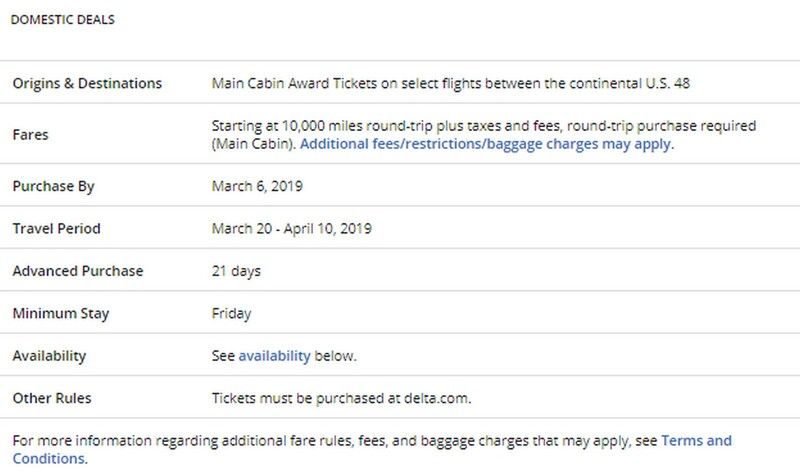 That is 20% off the normal saver award of 160K roundtrip for Delta One flights to Europe. If you have a healthy stash of Skymiles that is a pretty good deal but as Nick at Frequent Miler points out many of the flights can be had for 50K Virgin Atlantic miles as well. Delta is capping off the week with a limited but decent domestic flash sale. A lot of love for Boston but that works out if you are a Red Sox fan since you could catch their home opener with this deal. If you live in the Boston area there are a few good deals to some warmer weather as well.